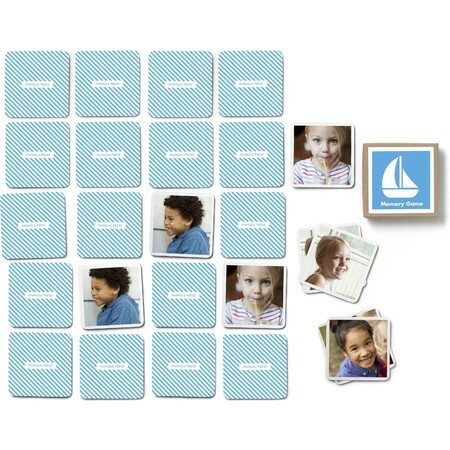 Let learning set sail with this memory game. Choose 12 of your favorite photos and let the games begin. Mix, match and you win! Sailboat design. The Pinhole Press Memory Game is certified by the Consumer Product Safety Commission and is recommended for children ages 2 and up. How does it work? Learn how to customize your Memory Game in this video. Give as an eGift makes it easy for you to give a gift that the recipient personalizes with their own photos and text. To gift this product, select the ‘Buy Now & Customize the Later’ option. At check out, select the option to ‘Give as an eGift’. Personalize your gift with their email, name and a custom message, and select the date for your gift to be delivered via email.